I accidentally found myself with two camera bodies and learnt how awesome it is to have two different lenses attached ready to go! I also learnt carrying two cameras via the neck straps is really not comfortable for any length of time. 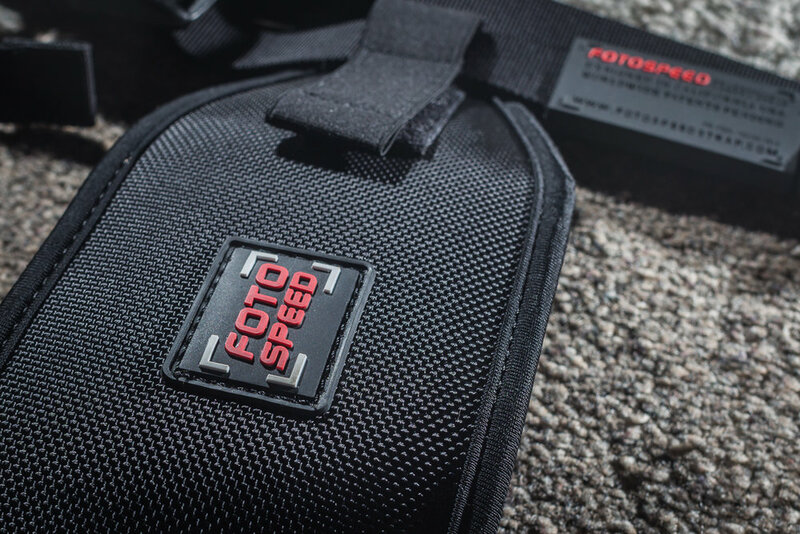 So I had been on the lookout for a dual camera strap and happened across the FotoSpeed F7 while at a photography expo. It seemed very comfortable, although it wasn't loaded at the time, but I decided to give it a try. You can find them online for around $149ish. 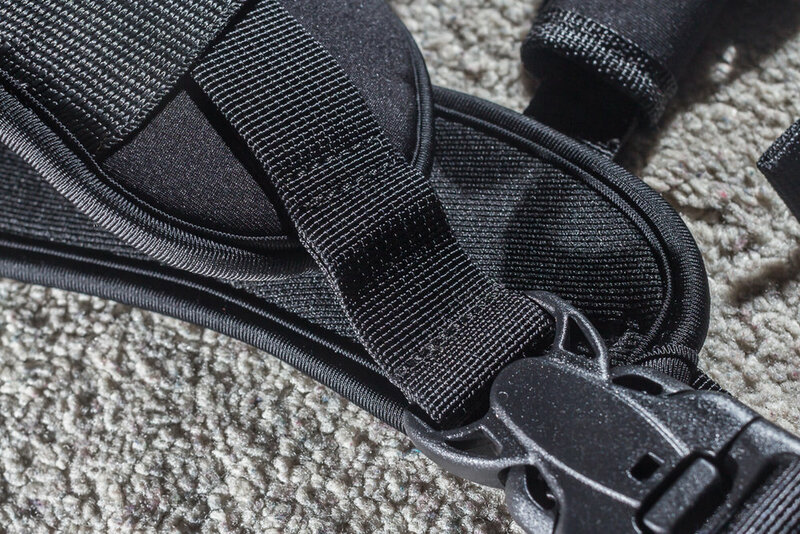 The harness has all sorts of adjustments, but the manual doesn't describe what each one does, but with some trial and error you can work it out. It is very comfortable to wear and spreads the load nicely across the shoulders. 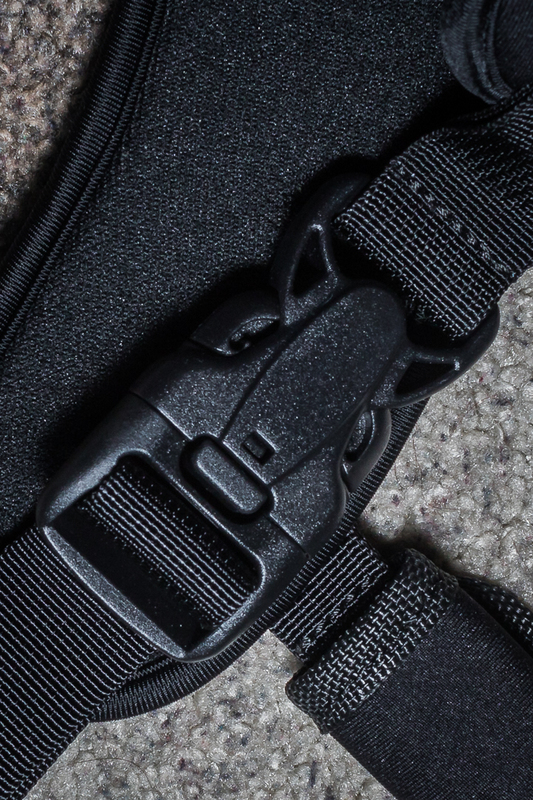 The harness attaches to the camera via the tripod thread using the supplied quick release fittings. The fittings themselves are rather fiddly to use, but they seem very secure. It also has a secondary lock that screws down to reduce the chance of accidental release. 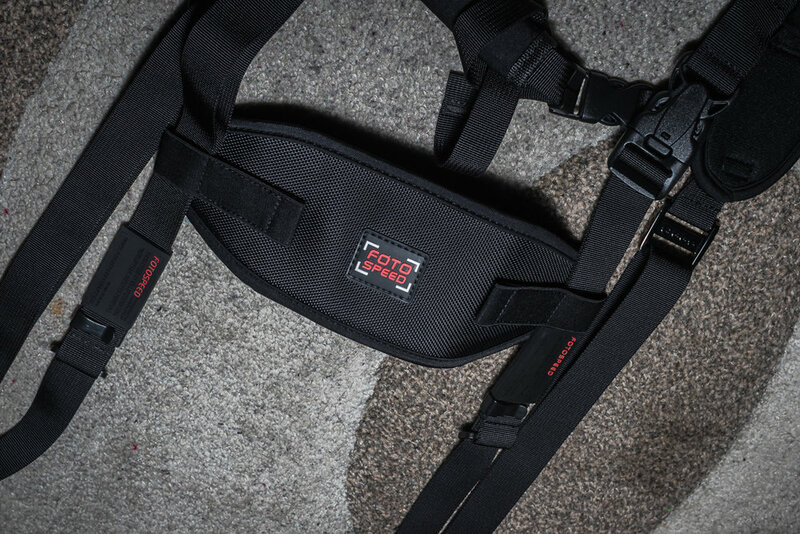 Additionally, it comes with a safety strap that you can attach to the harness and the original strap holes on the camera. The quick release fittings are nicely machined with knurled edges and flats so you can easily tighten it by hand. There is a rubber washer installed which seems a little soft and can distort if you tighten it too far. I guess you shouldn't need to tighten that much however. It does seem very secure. The quick release fittings are arca swiss compatible, but they didn't seem that secure in my gorilla pod ball head. (Sorry, it is the only arca swiss compatible head I have). It probably won't fall out but it is able to rotate slightly in the mount. The safety straps fits into the camera easily enough, the quick release buckle on it seems secure, I haven't had to test it yet. I have found the straps to have somehow come undone a couple of times though, which is a little worrying. I will likely sew the strap ends so they can't come undone, just in case I ever need to rely on it. There are D rings on the front of the harness, which I haven't found a use for, but it does help me identify which side is the front! To give it a proper workout I took it out for a field test at a National Park near my house. On the left I had a 7D MkII + 400 F5.6 and on the right I had a 7D + 24-105 F4. Even with this considerable weight it was very comfortable to walk around in, hands free! I also hung a tripod on the front brace while I scrambled over some rocks. Wished I did this sooner! These hang nicely from the 7D's tripod mount. Natural/fluid movement to get camera up to eye level. Hangs level when hung from the tripod ring on the lens. I don't like picking up this combination just by the camera so it's a little awkward bringing this up to eye level, but with practice I'm now able to bring this combination up to eye level and locate the target quite quickly. The lock is not capable of holding the 7Dii + 400mm F5.6L, it just slides down to the lowest point. 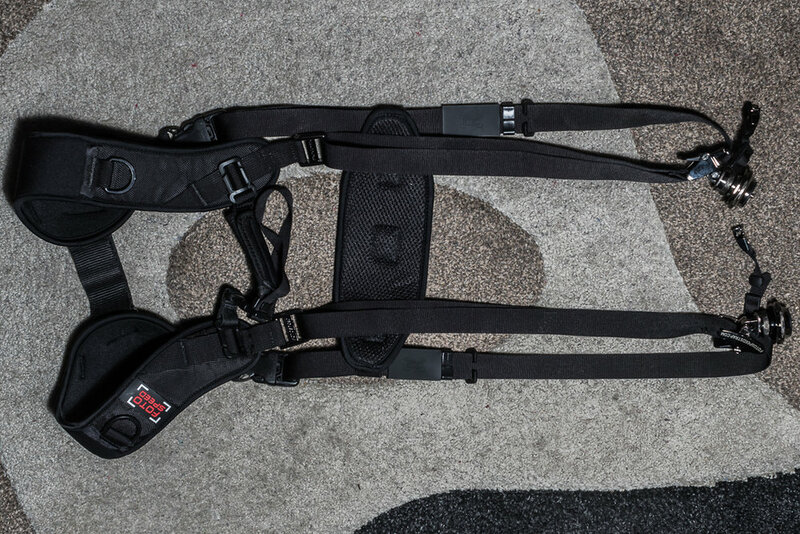 If you only want to take one camera out, you can separate the two halves and use half across your body, you can even separate the cross brace to acts as an underarm brace on the single harness. This was also much more comfortable than using the neck strap! I wished it had some pouches for memory cards or batteries too, although I can probably clip some to the D rings on the front, maybe that's what they are for?? In conclusion, the F7 is really nice for comfortably carrying two cameras at the same time and still having both your hands free with easy access to either camera. It reduces neck strain and allows me to walk for much longer without discomfort. I would definitely recommend everyone to move away from the standard neck straps and try a harness! Please note: I haven't used any other dual camera strap/harness so I don't know how it would compare to a Blackrapid or any other brand. The F7 was the first brand I saw and it happened to work pretty well.